How boring would life be if everyone's house had the same style of light fixtures? Today, that scenario is virtually impossible with the thousands of lighting options available, from overhead lighting (like spotlights and recessed lighting) to under-cabinet lighting to chandeliers, ceiling fan lights and more. Here's another variation on the lighting fixture craze -- track lighting! Track lighting, which consists of adjustable lamps mounted along an electrical metal track, is a great way to illuminate a room, especially if the room has specific areas or objects that need directed light. The electrical track (the track from which the lights "hang") supplies power all along its length, making it possible to aim the heads in any direction you choose. Track lighting is usually installed along the ceilings or a high wall, allowing the light to focus on anything or anywhere you want to draw attention. Many people use track lighting to illuminate a piece of art or a sculpture. It's also very popular as task lighting, especially in the kitchen. If you are looking for a flexible, versatile, stylish and easy-to-change lighting fixture type, then track lighting is a great choice for you. The first step in selecting a track lighting system for your home is to decide on the track head. There are hundreds of track head styles to choose from. Try to stay with the general decor theme of the room. Next, choose the bulb; you can pick from a wide range of bulb types including low-voltage, halogen, fluorescent, LED and halide lamps. The right type of bulb will depend on the quality and strength of light you want in the room. You will also have to decide how exactly you plan to set up the lights on the track. Your specific needs, including whether you want to highlight an object, will determine how you cluster the lights. The large amount of choice as to the placement of the lights is part of what makes track lighting such a great option. 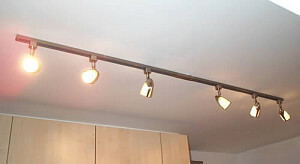 Track lighting is one of the simpler lighting types to install. In fact, there are kits which can be purchased that come with just about everything you need to install the lights. If you prefer to have a professional install your track lighting system, then make it simple and find a licensed electrician.